Well-designed and edgy elongated lined eye is a popular trend among makeup artists. The majorities of makeup artists love to play with elongated lined eye on the fashion runways. Elongated eyeliner look is a contemporary trend of the classic cat eye. Creating arrows, wings and points with your eyeliner is a good way to blend your makeup look in a way that’s both wearable and animating. We have provided in this article useful tips on how you can create the elongated line eyes and arrow-eyes look. This form of classic cat eye looks so fun due to the fact that the liner elongates the lash line. To produce this effect, create a thick line across the top lid and expand it at the end, raising it a little. To create it make use of liquid or gel, but ensure you have a brush that is sharp enough edge to provide you with a fine tip at the end. Junko Shimada created this eyeliner effect at Paris Fashion week show. This consists of thick lines with sparkles on the eyes. The eyeliner effect is made up of fun floating dots and thick, dramatic lines. 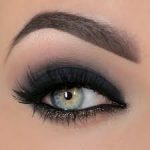 This elongated lined eye look evokes the 1980’s edgy look which makes use of a hard black line that elongates out from the corner of the eye to a very fine tip. To create this elongated lined eye look start from the inner corner of the eye and draw the eyeliner across the lash line, directly towards the temples. The best product to provide this form of effect is with the use of liquid liner with a fine point, and to go gradually. The eyeliner makeup look at the Aura Tout Vu show at Paris Fashion Week featured eyes that were artistically lined to look like real arrowheads. This example of eyeliner effect was featured at Rag & Bone. The eye look is sharp with thin wing levitating above the lash line. This is high glamour Egyptian inspired look which produces a dramatic appearance. 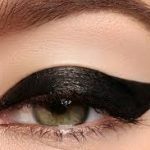 To get this effect, apply a black gel liner with a concealing brush all through the lid, leaving a sharp unblended line of delineation at the top. After that apply color over the liner with a glowing eye shadow of any color you choose. When you use a cream-colored shadow or eye gloss, it can provide more saturated and long lasting effect. This eyeliner look was popular during the ‘50s and ‘60s Hollywood shows. It is still being frequently used today on red carpets globally. 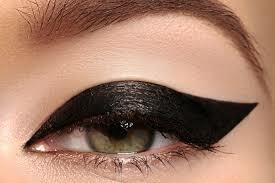 To create this eyeliner look, use a liquid or gel liner; line the top and lower lash with a definite thin black line. On the outside corner, make the eyeliner thicker and blend it away from the lashes to produce an elevated effect at the edge of your eye. To make the effect look more dramatic, fill in the corner under the line with white eye pencil or eye shadow and line the inner edge of the eye with white. These eye effects had a sweet and finely flirty look. It is produced with a strong line that provides a high tech contemporary feeling. The eye shadow starts dark and then fades away to a fine point. 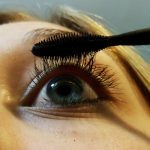 Start off with a dark, inundating eye shadow and produce a thick line from the lashes to immediately underneath the brow bone. Draw it past your eye or wing it out. However, you need to blend it down to nothing at the end. Echo the shadow effect below the outer corner to link with the top. This eyeliner look is great both on formal and evening wear. It also appears amazing when you use light white or opalescent shimmer to highlight it.